If possible, use ApiBase::dieWithError() instead of throwing this directly. Definition at line 28 of file ApiUsageException.php. Definition at line 38 of file ApiUsageException.php. References $status, getApiMessage(), StatusValue\isOK(), null, and ApiErrorFormatter\stripMarkup(). Definition at line 115 of file ApiUsageException.php. Definition at line 76 of file ApiUsageException.php. Referenced by __construct(), and __toString(). Definition at line 108 of file ApiUsageException.php. Fetch the responsible module name. Definition at line 93 of file ApiUsageException.php. Definition at line 101 of file ApiUsageException.php. Referenced by ApiTestCase\apiExceptionHasCode(), ApiParamInfo\execute(), ApiMain\handleException(), ApiFormatPhpTest\testCrossDomainMangling(), and ApiParseTest\testNonexistentPage(). Definition at line 63 of file ApiUsageException.php. References $code, $data, ApiMessage\create(), and StatusValue\newFatal(). 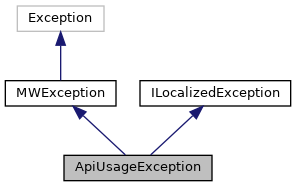 Referenced by ApiContinuationManager\__construct(), ApiBase\dieWithError(), WatchedItemQueryService\getWatchlistOwnerId(), ApiBaseTest\provideGetParameterFromSettings(), ApiTestCase\setExpectedApiException(), and ApiUsageExceptionTest\testNewWithMessage_ThenGetMessageObject_ReturnsApiMessageWithProvidedData(). Definition at line 30 of file ApiUsageException.php. Definition at line 31 of file ApiUsageException.php. Referenced by __construct(), and getStatusValue().